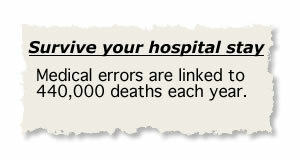 'Medical error' remains one of the most significant public safety issues. Evidence indicates that for all its technical prowess the American healthcare system generates an incidence of preventable harm and mortality that would not be tolerated within any other for-profit industry. Unfortunately, the U.S. government has failed to implement regulatory infrastructure capable of protecting the patient or even systematically tracking injuries associated with medical treatment. There are agencies that enforce regulations pertaining to: worker safety, nuclear energy, aviation, etc. However, there is no single federal agency charged with regulating medical practice or the power to compel best practices. The Institute of Medicine 1999 report, To Err Is Human: BUILDING A SAFER HEALTH SYSTEM begins with, "Health care in the United States is not as safe as it should be--and can be. At least 44,000 people, and perhaps as many as 98,000 people, die in hospitals each year as a result of medical errors that could have been prevented,". HealthGrades, Inc. provides a number of valuable consumer services including an annual patient safety report card for the industry. The Fourth Annual HealthGrades Patient Safety in American Hospitals examined 40 million Medicare hospitalizations from 2003 to 2005. The study found 1.6 million patient safety incidents in the patient records. It is estimated that the recorded incidents increased the cost of treatment by $8.6 billion. The study also found that patients who experienced a patient safety incident had a 25% chance of dying during their hospitalization. Of "the 284,798 deaths that occurred among patients who developed one or more patient safety incidents, 247,662 were potentially preventable." The Fifth Annual Patient Safety in American Hospitals Study, provided some evidence of improvement. The records of 41 million Medicare hospitalizations were examined and only 1.12 million patient safety incidents were identified. Preventable hospital associated deaths of Medicare patients decreased to 238,337 from 2004 to 2006. The 6th, 7th and 8th Annual Patient Safety in American Hospitals studies are based on a reduced number of patient safety indicators. HealthGrades warns readers that previous Annual Patient Safety in American Hospital Study data are not comparable year over year. The Eighth Annual Patient Safety in American Hospitals study further reduced the indicators studied from 20 to 13. HealthGrades admits that these studies capture only a fraction of recordable patient safety events and deaths. Obviously Medicare patients are endangered by the health care industry. This is evident from the fact that the 2007-2009 hospitalized Medicare patient retained a 10% chance of dying if she/he experiences only one of the 13 tabulated preventable patient safety events. Evaluate care unit's patient safety culture. Identify a project team to include: physician leader, nurse leader, staff nurse, pharmacist, senior executive. Learn from one preventable error per month. Re-evaluate unit's patient safety culture. Provide team training and communication strategies. A goal sheet providing clear expectations to guide care. Educate staff on bloodstream infection control practices. Create a central-line cart that contains all equipment needed to comply with evidence-based guidelines for central-line insertion. Institute a policy that requires nurses to assist in central-line insertion. Require use of a checklist to ensure compliance with evidence-based guidelines for central-line insertion. Provide regular feedback to staff on infection rates. An estimated 13.5 percent of Medicare beneficiaries (134,000) experienced adverse events during their hospital stays that resulted in temporary harm. An additional 134,000 Medicare beneficiaries experienced at least one serious adverse event that resulted in prolonged hospital stay, permanent harm, life-sustaining intervention, or death. Approximately 44% of all adverse events among Medicare beneficiaries were determined to be preventable. A New, Evidence-based Estimate of Patient Harms Associated with Hospital Care authored by J. James and published in 2013 states "the true number of premature deaths associated with preventable harm to patients was estimated at more than 400,000 per year for the years 2004-2008. Serious harm seems to be 10- to 20-fold more common than lethal harm." Lucien Leape, a member of the committee responsible for the 1999 IOM report has concurred with the findings of the James study and has suggested that the results supplant the prior IOM estimates. Makary and Daniel "calculated a mean rate of death from medical error of 251,454 a year using the studies reported since the 1999 IOM report and extrapolating to the total number of US hospital admissions in 2013." "We believe this understates the true incidence of death due to medical error because the studies cited rely on errors extractable in documented health records and include only inpatient deaths." Nursing provides the vast majority of direct patient care. Whether it is transmission of nosocomial infection, medication error, wrong-site surgery, failure to protect, etc. ; nursing was probably involved at some point. Nursing must act to establish safe patient care as its singular purpose. 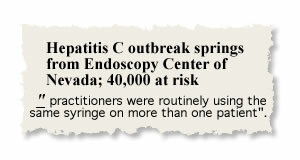 Hepatitis C outbreak springs from Endoscopy Center of Nevada; 40,000 at risk. Wednesday, Feb. 27, 2008 | 2:41 p.m.
James, JT. (2013) A new, evidence-based estimate of patient harms associated with hospital care. Journal of Patient Safety 2013 Sep;9(3):122-8. To Err Is Human Building a Safer Health System Linda T. Kohn, Janet M. Corrigan, and Molla S. Donaldson, Editors Committee on Quality of Health Care in America INSTITUTE OF MEDICINE NATIONAL ACADEMY PRESS Washington, D.C. The Fifth Annual HealthGrades Patient Safety in American Hospitals Study. 2008 Health Grades, Inc. The Sixth Annual Patient Safety in American Hospitals Study. Golden, CO: HealthGrades, Inc.; April 2009. James J. (2013) A New, Evidence-based Estimate of Patient Harms Associated with Hospital Care.